Number One Fan is the recipient of an unlikely luck of the draw. Hailing from Appleton, Wisconsin, not exactly known as a hot bed of happenings to the rest of the industrialized world, the foursome -- five with just added keyboardist -- earned their stripes playing countless shows and continual self-promotion. Then for whatever reason, a big shot manager gone label maker stumbles upon them, offers a contract as the inaugural signing to "Pat's Records" and next thing ya know, they're playing to thousands on Van's Warped riding the wave of success previously created by bands like Something Corporate, Jimmy Eats World-- Boy Meets World, and whoever else follows the flow of post-teen flightiness and wholesome goodness. "Compromises" is comprised of ten tracks, each its own entry into the rise and fall of the on-campus romance and the number one reason why most Pop groups ever put pen to paper in the first place. Yes, been done to death, not only by the aforementioned, but countless others in the distance who're still living off the royalties that broken relationships are wont to bring. NOF's tunes are tuneful and melodic, catchy, charming, and occasionally cranky, simply written and played; they're organic as one might expect of their mid-western, low populated origins, and it's evident by the unity presented in the playing and production they've paid dues perfecting their craft. Wishy washy heart-tuggers persist on "It's Happening," "The Prettiest Sin," and the emotive standout, "Sorry," amidst hip-shaking, college radio would-be adds like "Come On," "Don't Say Anything," and the unusually tumultuous "Make The Cut." 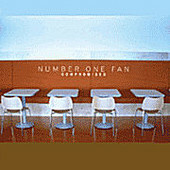 Aside from the aforementioned, a number of comparative options present themselves -- it's rather unavoidable from one to ten -- the soft and gentle sincerity of Counting Crows or The Cure, to a lesser degree, and particularly in the vocal department where Nicholas Ziemann caresses the croon with care, at times forcibly noticeable and others, choking back the tears. "Compromise" is heavy-hearted and musically mild by Emo-Rock standards, yet it's in there, ever present to often strong verses. There do appear the handful of heard it all before build ups and pre-choral arrangements, and so while they rank as a decent and respectable debut for the devilishly clever Pat's Record Company, they might be difficult to spot in a crowd.